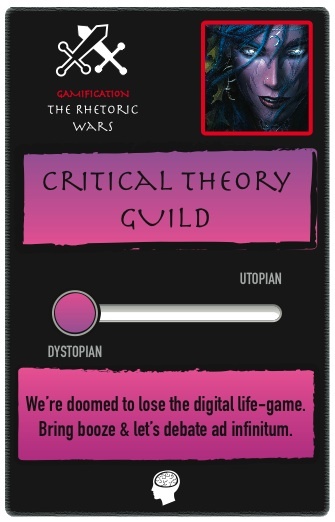 The Royal Melbourne Institute of Technology (RMIT) recently launched their Games & Experimental Entertainment Lab (GEElab). 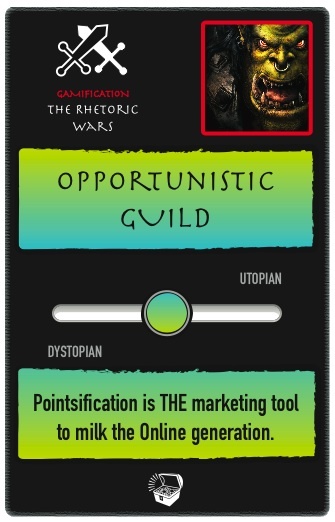 During SXSW GEElab director Dr. Steffen P. Walz handed out cards, co-created with Lancaster University’s Dr. Paul Coulton, for Gamification: The Rhetoric Wars. Designed in the style of Magic: The Gathering, these cards depict 5 different guilds that represent a thought-camp in the arguments for and against gamification. 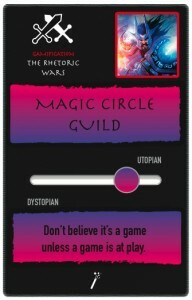 The guild types fall into the realm of a utopian, dystopian, or neutral mentality, all of course being rather tongue-in-cheek. 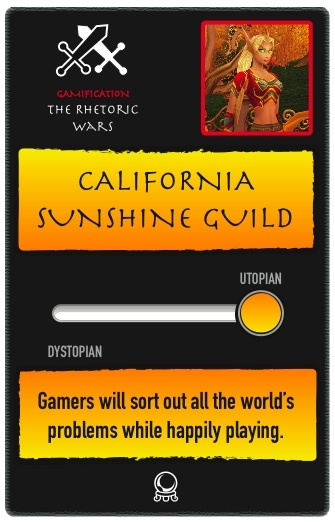 On the far utopian end, you have the “California Sunshine Guild- Gamers will sort out all of the world’s problems while happily gaming“. 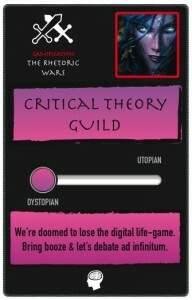 Meanwhile on the dystopian end you have the “Critical Theory Guild – We’re doomed to lose the digital life-game. Bring booze & let’s debate ad infinitum“. 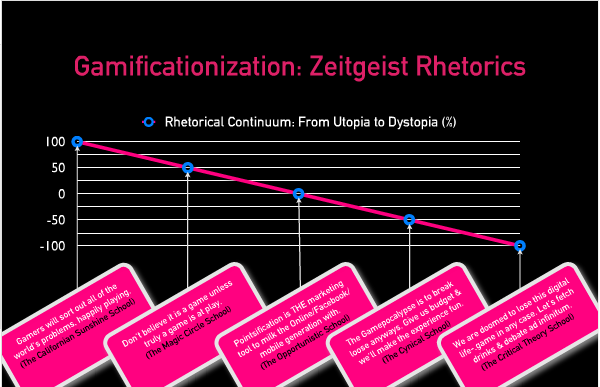 The cards were originally based off of a talk given by Steffen at the LIFT conference in Geneva about the different approaches and rhetoric surrounding gamification – Gamificationization as he calls it. 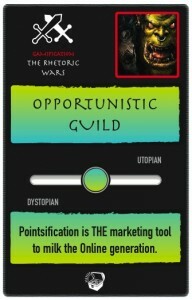 It’s true that there are many dedicated professionals speaking on both sides of gamification, with sincerity and passion. 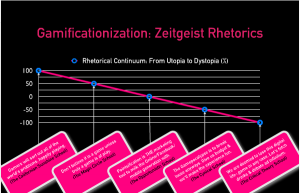 In order for any real progress to happen, everyone has to be open minded enough to see the issues from all possible angles in order to best utilize new engagement theories and explore all the possibilities whether it’s for marketing or for world problems. 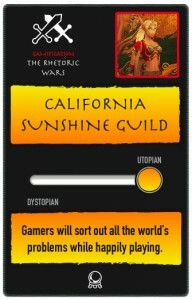 This requires not taking one’s self so seriously from time to time. 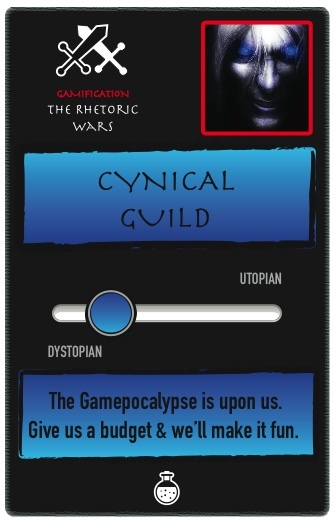 We can expect to see more interest things coming out of GEElab, as they continue to explore (and occasionally, poke fun at) the changes happening to the landscape of entertaiment through gaming and intersection of social content and new technologies.